Key to the XC10 is its lens. Again, this is one of the much-discussed aspects of the camera. Well, the answer to that question is pretty obvious. Firstly if you used existing EOS lenses you would be using very little of the lens’ images circle, so there would be a 2.7x crop factor. To put this into some sort of perspective, a 50mm lens would become the equivalent of a 135mm lens. A 24mm lens would become the equivalent of a 65mm lens, so it becomes extremely limiting unless you have a set of ultra-wide lenses or you want to produce telephoto shots. To make a whole new system of cameras and lenses would require a huge investment, which is a huge risk for any manufacturer, especially with a product primarily designed for the smaller video market compared to the larger photography market. Add a larger sensor and give it an EF mount and it becomes a very different camera. It would become larger due to the size of the sensor and the back-focus distance required. Canon don’t currently have a 4K APS-C sensor and a full-frame one would cannibalise sales of its more expensive cinema cameras. 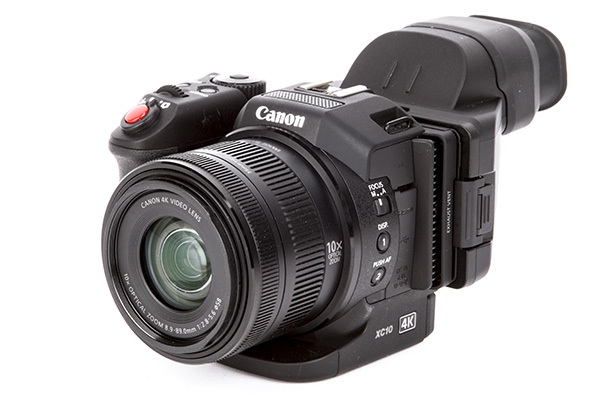 Instead the lens is a Canon 4K video lens with a 10x optical zoom of 8.9-89mm, the equivalent of 24-240mm, or 27-270mm when in the video capture mode. The aperture is f/2.8-5.6, though this starts to stop down quite quickly. At around 30mm it is at f/3.2, by around 50mm it is at f/4 and t reaches f/5.6 by approximately 180mm. It is a shame that the f/2.8 aperture isn’t constant throughout the range – the Sony Cyber-Shot RX10 II manages to have a 24-200mm f/2.8 lens that isn’t a great deal bigger. At very least, keeping f/2.8 until around the 70mm equivalent mark would have been useful for those wanting to shoot interviews. With the smaller sensor it is more difficult to achieve achieve a shallow depth of field, though that said it is still possible to throw a background nicely out of focus with the XC10, but it does lack a little of that cinematic look that a real shallow depth of field creates. The lens is focused via an electronic, fly-by-wire, focus ring. This has three different levels of sensitivity, which helps, but it can be difficult to do any kind of focus pulling when real accuracy is needed. The algorithm certainly needs looking at, and it can be a little slow to react when you first try to focus after the camera has been turned on. For making sure that the lens is perfectly focused, the XC10 has focus peaking with three different colour options. There is also focus magnification to make sure that the focus is accurate at a pixel level. When switching to autofocus the camera focuses quite fluidly and smoothly, and of particular use is the focus tracking/face detection. 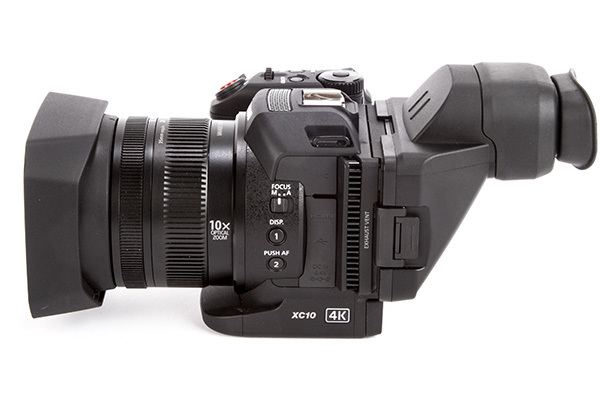 Lock on to your subject and even if the camera or subject moves, then the XC10 will maintain focus on that subject. It is really useful for face-tracking when shooting interviews. Although the focus ring may be electronic, the zoom barrel is a manual, mechanical affair. This has both good and bad points. For quickly changing the focal length, particularly for those coming from a photographic background, it is very quick. However, trying to do a smooth zoom can be tricky without a focus pulling device, and this is where an electronic motorised zoom lever or toggle switches would have come in very useful. That said zooming whilst shooting isn’t something that you want to regularly do, and for the odd occasion you do, it may take a bit of practice. Certainly don’t expect to do it whilst handholding the camera, but it is possible. Optically the lens is constructed of 14 elements in 12 groups, with a 58mm filter thread and 8-bladed aperture. The mechanical shutter is actually part of the aperture.